Don’t not laugh in front of the Joker. It seems like a bad idea. Batman and Catwoman’s rapidly-approaching wedding has had a rough time when it comes to planning. Batman’s potential Best Men accidentally got caught up with Hush. Booster Gold’s wedding gift screwed up the timeline to hell and back. And now, the Joker’s shown up at the worst possible time—but he might have done something good in the process. We’ve known for a while that the DC Wedding of the Century was heading toward a collision course with the Clown Prince of Crime, ever since he managed to invite himself to the proceedings. Batman #48 gave us the first half of that collision in the form of a violent encounter between Batman and the Joker at a church; it culminated in the Joker-ian dichotomy of the villain asking Batman if he is Bruce’s choice for best man, before promptly blowing him up with a bomb and attempting to shoot him. The Joker pops the question to Batman in Batman #48. 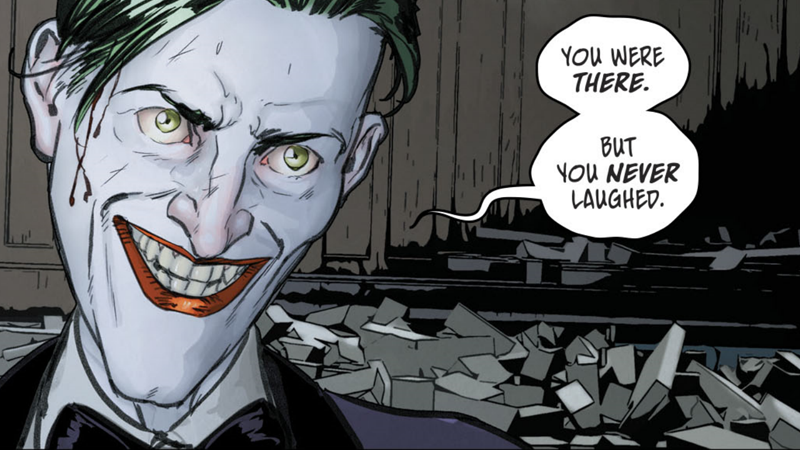 Last week’s Batman #49—by the same team of Tom King, Mikel Janin, June Chung, and Clayton Cowles—continued the encounter, but this time with the Joker squaring off against the bride-to-be. Their tussle is less explosive, mainly because it’s cut short after Catwoman and Joker both get critical shots in (a gunshot to Catwoman’s torso, a claw-slash to the Joker’s throat), leading to the two slowly bleeding out in the ruins of the bomb blast. If Selina moves and stops stemming the bleeding from her torso, she’ll die. If the Joker removes his hand from his throat to reload his gun and finish her off himself, he’ll die. It makes for a stunningly tense scenario as, eventually, the two decide to just chat while waiting for one or the other to bleed out. Just as with King’s sublime work with Mitch Gerads in Mister Miracle, it’s a scenario that invites us to appreciate the normality lingering beneath the absurdity inherent to superhero comics. Here are two former colleagues reminiscing about the good old days, except the colleagues are a master thief who dresses like a cat and a madman who dresses like a clown, and the good old days are the times they ganged up to defeat a crimefighter with a troubled past with a penchant for dressing up like a bat. Ah, the thoughts that cross your mind while bleeding out on the floor of a bombed-out church. But beyond appreciating that absurdity, and the grim humor the situation commands—Selina reveals a joke she made up for herself as a orphan child, silly but yet something that was her own, the Joker keeps ever-so-politely asking her to be a dear and hand him his ammo so he can just shoot her—their conversation turns into a thesis on Catwoman and Joker’s respective relationships with Batman. And really, beneath that, it becomes the ultimate story of what Batman and Joker actually mean to each other, at least from the latter’s twisted perspective. Selina’s thoughts drift to how she found a similarity with Bruce over their shared childhood traumas—they were both miserable, and because she knew that misery, she also knew that deep down they could find happiness together. But the Joker’s relationship with the Batman isn’t derived from familiarity, but instead the fundamental need for there to be a counter-action to Batman’s existence. He was born because of the Batman, he creates chaos to go up against the Dark Knight’s order. The two are nothing alike in the way that Selina and Bruce are, but to the Joker, their relationship is vital because it is symbiotic. They exist to be the antithesis of the other. If the Joker doesn’t exist, Batman can be happy—and is Batman still Batman if he allows himself to be happy? The Joker delivers his ultimate thesis on why Batman exists. It’s a belief that harkens back to the reasons Bruce became Batman in the first place, as he confided to Selina nearly 40 issues ago. Bruce has always seen becoming Batman as a punishment, as the end of a life as he knew it to be born as something else—something that does not require the happiness of a normal life, or a life shared with someone else, just as the Joker opines here. He believes they are fated to be locked in opposition, but at least in this regard maybe the Batman and the Joker are more in alignment than either of them could know. In the end, the Joker’s desire to keep that duel as never-ending as it has been leads to his undoing. His desire to ensure Selina’s death—and thus Batman’s chances of a happy life—momentarily overrides his own need to exist and maintain the cycle of conflict. He lets go of his throat, reloads his gun, and before he can pull the trigger, the Joker dies. And with that, the Joker dies. For now. Now, it’s hard to say if there’ll ever be a level of permanence to this death. After all, it’s not the first time the Joker’s died and come back to life. Hell, one of the still-quietly-lingering mysteries of DC’s “Rebirth” era is that there were in fact three Jokers operating in existence, a thread that still remains untouched (although answers are allegedly still coming in the form of a Geoff Johns/Jason Fabok team up). Plus, as this issue reminded us, there is an inherent level of absurdity to superhero comics, an absurdity where we are trained to believe that the death of a hero or villain is never really the final end. There’s always a way out, no matter how final a death seems. But even if the Joker lives to die another day, the gift he gives in dying here—that chance for Batman and Catwoman to still get married, to eke out a bit of happiness in all their miseries together—could still lead to a certain kind of death elsewhere: the end of the Batman as we know him. Because we’re about to find out very soon if Batman can still be Batman, whether in the same form or in a changed other form, if he is truly happy. That is, if next week’s wedding of the year goes off without a hitch, of course.